The powerful motor operates just above a hush..It constantly circulates the ice water at the selected temperature.pulling heat out and delivering fresh ice cold relief directly on the treatment site. The legs are wrapped in a dry circulating pad.. Circulation pathways ensure a uniform temperature over the treatment site..maximizing the therapeutic value. 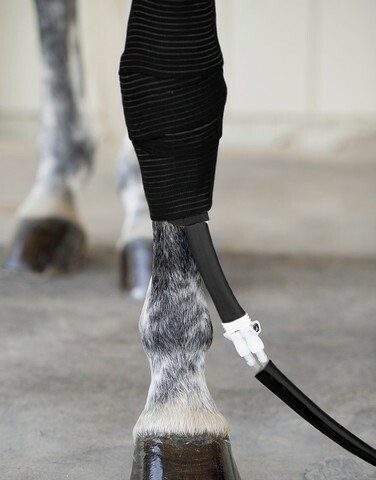 A quick connect coupling allows easy removal from the horses legs. A neoprene insulating compression bandage optimizes treatment efficiency by keeping the cold in and providing passive compression for maximum treatment site contact.. 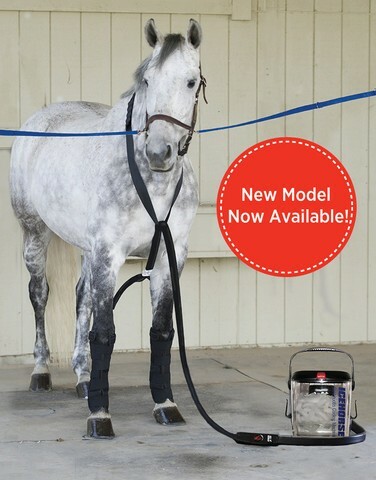 The gentle mild compression provides soothing comfort to the horse which helps shorten recovery time. The control dial on the insulated hose contains a thermometer which allows you to control treatment site temperature You can cool as rapidly or gradually as is needed. The single pump cold therapy system includes "y" splitter for treating both legs at once, two rectangle pads, two insulating compression bandages and the power unit, all assembled. 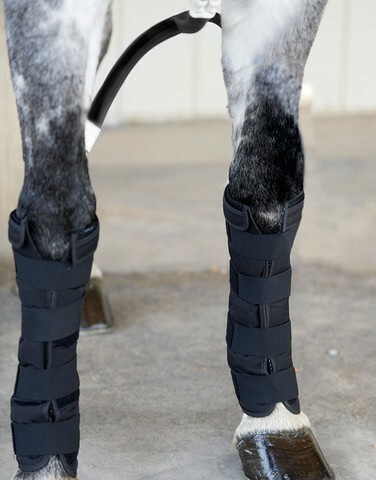 Also available is a multi purpose pad for treating hocks, pastern fetlock areas as well as knees. Operates on either electrical or battery power. Rechargeable 12 V battery optional. 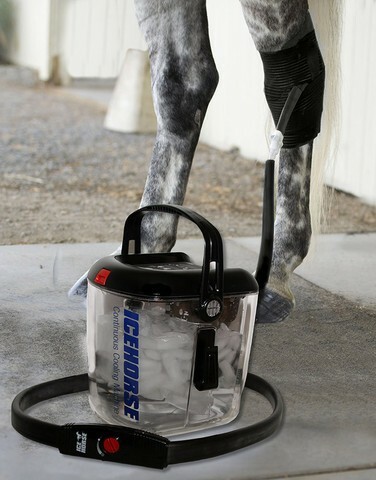 The Ice Horse trainer model is complete, to treat two legs. Includes passive compression bandages, dry/cold therapy wraps.